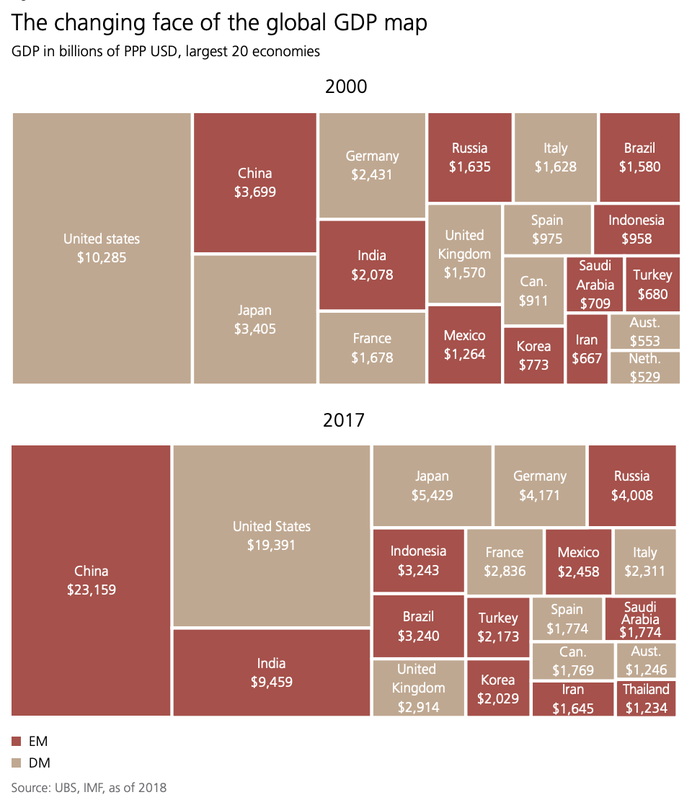 Emerging Markets have now surpassed the number of Developed Market countries in the world’s 20 largest economies. Interestingly, Iran’s economy is almost as large as Canada’s in 2017. The results from tonight’s midterm Elections in the US are going to be crucial for the stock market going forward. If the polls are correct, President Trump and Republicans are in big trouble. There’s an 85% chance Democrats will seize control of the House of Representatives from Republicans, according to statistical analysis firm FiveThirtyEight. However, it turns out there’s a shockingly easy way to predict whether stocks will rise or fall after a midterm election. And it has nothing to do with predicting in advance which party will win. Since 1946, there have been 18 midterm elections. Every single one. That’s 18 for 18! We’ve had every possible political combination in the past 72 years. Republican president with Democratic Congress. Democratic president with Republican Congress. Republican president and Congress. Democratic president and Congress. The market climbed higher every time. Since 1946, stocks have jumped an average of 17% in the year after a midterm. In addition, we are also entering the third year of a presidential term, which is historically the strongest year for stocks. Why Do Markets Behave This Way with Such Remarkable Consistency? 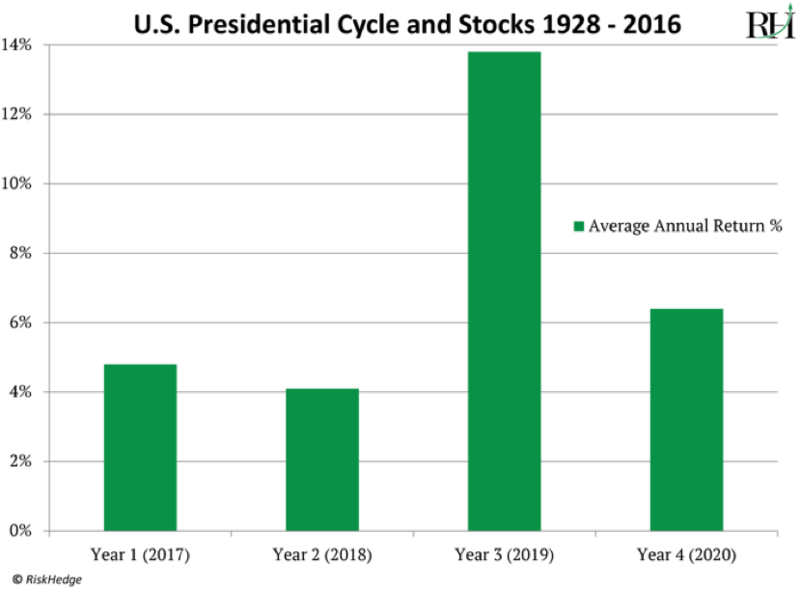 Glance up at the chart above once more and you’ll notice the second year of the presidential cycle is typically the worst for stocks. That’s the year we’re in right now—the year when midterms occur. There’s one last important point you should know. Leading up to midterms, US stocks typically perform poorly. From January to October in midterm years, they drop an average of roughly 1%. In all other years stocks rise roughly 7% in that timeframe. Think of midterm elections like a thick fog covering markets. They obscure what the political situation will look like in the near future. Unable to see what’s coming, investors get nervous and act cautiously. Just as they would slow down while driving a car through a thick fog. Once the election concludes and the fog clears, investors regain confidence and the market gets back on track. 2018 is following this script to a T.
For all the market’s gyrations in the past few weeks, the S&P is roughly flat year to date. If we stay on script, we should expect the market to surge in November after the uncertainty of the elections is behind us.